Have you been hurt in a collision with an animal? As surprising as such an accident is to the motorist involved, sadly such an occurrence is not uncommon. This is especially true in a state like Maryland where much of the land is situated in rural areas. 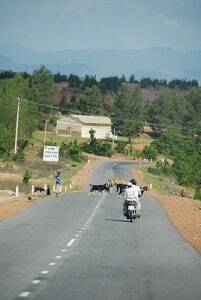 Wandering farm animals and pets, particularly on country roads, often turn into deadly roadblocks. 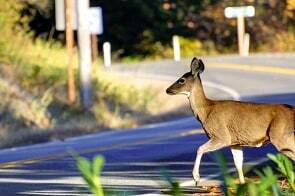 Maryland also has the third highest deer population in the country behind Pennsylvania and Western Virginia, making deer another potential hazard for motorists. In fact, Maryland ranks 13th in the nation in animal-related accidents with about 1,500 annually. These collisions with livestock, pets, and wild animals can oftentimes be deadly. Every year in Maryland, animal-vehicle crashes cause at least one fatality and more than 200 injuries. Farm animals and wild animals can be extremely large, weighing hundreds of pounds. Direct impact with such an animal could cause a driver to be severely injured. Worse, to avoid direct impact, motorists may stop short or suddenly swerve, which leads to serious accidents with other vehicles. This is known as secondary impact. Death and permanent debilitating injuries are often the tragic results of such accidents. When are Collisions with Animals Most Serious? Stopping short to allow an animal to cross into the roadway and being rear ended by another motorist. Joe owns a farm in Carroll County. On his farm, Joe has a number of cows and horses, and he is extremely fond of his animals. So fond in fact that he believes it's wrong to keep them confined. 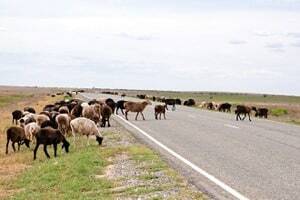 Instead, he lets them roam and graze freely on his property even though his farm is adjacent to local highway 101 and he doesn't have a fence to keep his animals off the roadway. Joe clearly isn't very careful. On a summer evening at dusk, Bob is on his way from the city with his wife Jane to visit his in-laws in Carroll County. As Bob proceeds up highway 101 going the speed limit, he suddenly sees what looks like a large shadow step out into the roadway, directly blocking his lane of traffic. As his headlights illuminate the shadow in the road, Bob sees one of Joe’s cows standing directly in his lane of traffic. Bob momentarily freezes and panics, but somehow manages to step on the brakes and jerk the steering wheel to the right. He clips the cow’s back legs with his front left bumper as his car goes off the road and lands in a ditch on the side of Joe's property. The force of the crash causes Bob’s head to jerk back and then forward with great force, while Jane’s left leg is trapped under the weight of the vehicle. Bob's wife Jane suffers a broken leg and Bob suffers a broken neck. Both will need surgery and substantial physical therapy. The accident can be traced back to Joe's irresponsible ownership and maintenance of his farm. If it were not for Joe's failure to secure his animals to his property, Bob and Jane would not have been severely injured. Given their injuries, Bob and Jane may be entitled to significant compensation. What are The Kinds of Cases That Lead to Settlements? Victims in these accidents want to know what can I recover when I am injured in a car accident claim where I collide with a animal. The real answer is that it depends. Let's talk first about the type of claim where you cannot get compensation. Car crashes with deer or other wild animals if you are the driver of the vehicle. No person or company negligently released the animal - the deer or whatever the wild animal is. You can't sue the negligent deer, obviously, and there is no one else to stand behind a claim. Passengers are often in better shape but the claim is against the driver. The allegations typically involve speeding or failure to drive prudently in anticipation of all risk, including darting animals. Are these claims viable? It really depends on the case. Keep in mind that the defendant need only be a cause of the crash, not the sole cause. The type of claims that are viable are the ones where the victim was hurt by an animal that should have been restrained. This is usually a wreck with a pet or commercial livestock. In these cases, there are viable claims against the owner of the animal for their failure to properly restrain the animal. It is their negligence that is at issue in that case. Who Will Pay Any Settlement or Verdict for my Injuries? On the other hand, if the animal is a pet that was not properly restrained or kept on a leash, there is money behind a claim if the owner of the animal had homeowner's insurance, renter's insurance, or some other policy that would cover the loss. People are surprised at how expansive homeowners' policies are in this regard. Of course, we are dealing with animals owned by a farmer or other commercial entity. There is usually insurance behind these claims. Maryland: $190,000 Settlement. In this case, the plaintiff was driving his vehicle on his way to work when he noticed a deer running in the field next to the road. He slowed up in anticipation of the deer crossing the road, which it did. The defendant, driving behind the plaintiff, also noticed the deer but failed to realize that the plaintiff had come to a stop, badly rear ending the plaintiff’s vehicle. The plaintiff suffered a head injury which led to permanent brain damage. (John Freese v. Keener Kitchen Co., Cir Ct. Balt. County, (2005). California: $2,000,000 Award. This case involved two plaintiffs who were riding in a vehicle when they collided with a large steer, which had escaped from the defendant’s auction yard onto a public roadway. The plaintiffs argued, and the jury agreed, that the defendant failed to take appropriate measures to restrain the animal within a fence to ensure the safe travel of motorists on the adjacent roadway. The two plaintiffs suffered multiple debilitating injuries including severe brain damage. This large pain and suffering award underscores how serious a collision with an animal can be and the jury award reflects that seriousness. (Feasel v. Shasta Livestock Auction Yard, Unknown Ca. St. Ct, (2000). If you or someone you care for has been injured in a car wreck caused by an animal in the roadway, contact the attorneys at Miller & Zois right away. We are highly experienced attorneys who have won verdicts and settlements for victims of all types of car accidents. We are here to guide you through the legal process and we will do our very best to secure a positive outcome for you and your family. Call 800-553-8082 or contact us online. How much money can I expect for my case?